If you are looking for a good diet plan, one that is tasty as well as healthy, look no further than the Mediterranean diet plan. It’s a lifestyle plan rather than a simple diet, and is tailored to provide proven results and keep you healthy. The Mediterranean diet plan has been hailed by international health organizations as one of the best diet plans for healthy living. It reduces the risk of cardiovascular disease and diabetes and is also a convenient and attractive diet to follow, as the plan features a lot of tasty foods. The Mediterranean diet is not your common prepackaged diet, and it is not a crash diet for weight loss. It is definitely not a commercial diet that you follow for a little while to lose weight. Instead, it is a lifestyle plan that revolves around a healthy way of life. The Mediterranean diet plan reflects the eating habits and the lifestyle of the people living along the Mediterranean coastline, and this includes Greeks, Italians, and the Spanish. For this reason, it is a vibrant cuisine that offers a wide variety of food choices. 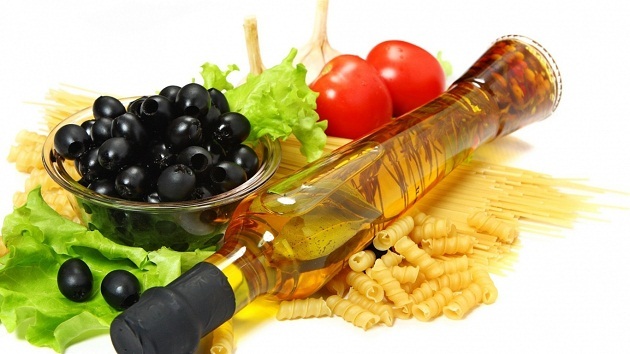 Who Can Take Up The Mediterranean Diet Plan? The Mediterranean diet plan can be taken up by anyone with an active lifestyle. This does not mean you have to be an athlete, but you must not sit around all day on your couch either. If your lifestyle is sedentary, for instance, if you have a desk job, try to incorporate a good exercise regime or any physical activity routine into it. You might try cycling or going for a long walk or run each day. Such activity, along with the Mediterranean diet plan, can ensure that stay at the peak of your health. In Mediterranean cuisine, the emphasis is mainly on plant foods. Stay away from too much animal fat, but meat is not completely excluded – you can include it in moderate quantities. It just does not form the bulk of your diet. Fruits, vegetables, legumes, nuts, and olive oil will form the major part of your diet. This diet also includes dairy products such as cheese and yogurt, poultry, eggs, and fish. These form a much smaller portion of the diet than the plant-based foods. Olive oil is used for cooking as well as to add flavor to the meals. It contains unsaturated fats, which makes it healthy and reduces the risk of heart disease and other related problems. It also reduces the chances of fat buildup in the body. Fish and poultry are used more than red meat in this diet, which is consumed in very small portions. Even eggs are consumed far less frequently than in other diets. The maximum total fat in this diet is estimated to be around 35% of the total calories, so it is a good diet that can help prevent weight gain. If you are used to a meat-rich diet and fried foods, you might wonder if a mostly plant-based diet can be as filling or as tasty. As mentioned before, the Mediterranean diet plan is not a diet per se. It does give you a wide variety of foods to choose from. Just keep in mind the basic meal structure, which insists on more plant-based food, olive oil in the place of butter, a little poultry and fish, just a few eggs and even less of red meat. The Mediterranean diet has been studied for a long time now, to document its tangible health benefits. A set of fifty studies conducted in 2011 suggests that the Mediterranean diet plan could reduce the risks for conditions like high blood sugar, hypertension, fat buildup, and high cholesterol. Another study found that the diet, which is rich in plant foods (including whole grain) and has reduced amounts of fat-rich dairy products and red meat, also lowered the risk of diabetes. 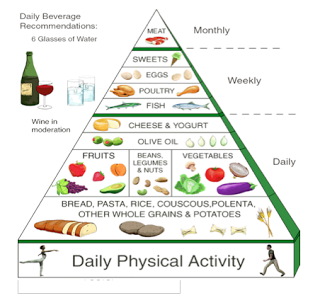 Oldways, a non-profit dietary organization, in collaboration with the Harvard School of Public Health, designed a Mediterranean Diet Pyramid that clearly illustrates the basic lifestyle pattern of the Mediterranean people. The emphasis is the lifestyle pattern, not just the diet pattern. Because, the Mediterranean diet plan is not just about the food. It is also about the physically active lifestyle of these people, and the way they dine in a leisurely manner along with their family members. It is believed that when family members eat together, enjoying the meal in an unhurried manner, they feel more content with their meals, make healthy food choices, and influence their children to eat nutritious meals in the place of junk food. It has also been found that children who are exposed to a large variety of foods develop healthier eating habits. A study published in the magazine Appetite suggests that children who followed a Mediterranean diet plan experienced higher levels of alertness, contentment, and vigor. 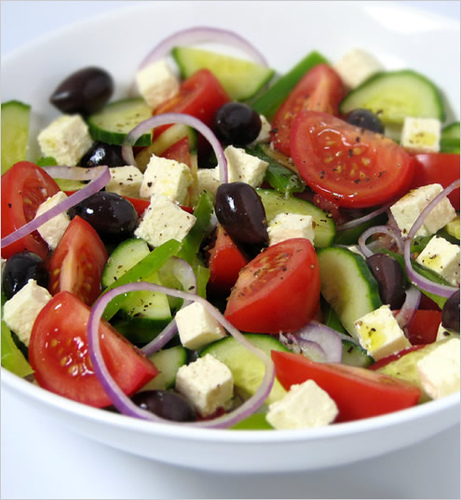 These are compelling reasons enough for you to switch to a Mediterranean diet plan. Just think of the wide variety of cuisines and the tasty food that you can try, and the great health benefits and healthy dining habits that you can acquire through this diet!